On a bright, crisp day in October 2015, Roby Kight rode with sons Steve and Ric along rows of neatly manicured pecan trees. From certain vantage points, it seemed as if the lines of trees stretched on forever. The sun glinted through the verdant layers of crosshatched leaves, occasionally meeting with Roby's upward stare. His eyes were trained upon the fruits of their labor. The pecan harvest was imminent. For about thirty years, these trees stretched themselves toward the warmth of the same sun, flourishing within and then beyond the vision Roby had for his west McCracken County farm back in 1984. 80 of his 150 acres were now dedicated to pecans, and the harvests kept on growing. Roby had been a nuclear chemist by trade; and a successful one at that. He held thirteen patents from his work on classified uranium enrichment processes. But it was old-world ingenuity that held his attention. "He was a farmer at heart," says Ric. "He loved being out on a tractor more than anything else. After he retired, he'd spend ten to twelve hours a day in the orchard, from the crack of dawn until sunset." Roby loved the land and the potential it represented. And after years of trial and error, hard work, and patience, he'd managed to develop the largest pecan orchard in the state of Kentucky. Pecans weren't Roby's first foray into farming, however. "If you look at this farm," says Steve, "and you drive on west, you'll see a big bridge. That is Little Massac Creek. It will come out of its banks in a heavy rainfall. You can't raise soybeans or corn. We tried that. They can wash away. He had also done tobacco, cattle, hogs, and even catfish ponds." "All this was during our youth. Steve and we were his labor force," laughs Ric. "We were involved in all of that." "Dad knew that pecan trees wouldn't wash away," adds Steve. "They may get wet, but they won't wash away. And he really believed in the health benefits of the pecan. There's protein, zinc, magnesium, manganese, and much more. They are good for the heart." "He and his wife Martha started going to pecan-grower conventions in Georgia and Texas and Oklahoma," says Ric. "Dad already had some experience with pecans. He'd started a small orchard in Bell City, MO right after he got out of college. The love of that never left him. And he realized that the pecans being sold around here at the time didn't give justice to what a pecan tastes like. Once you have a fresh, golden pecan that's been treated right, you'll know the difference." 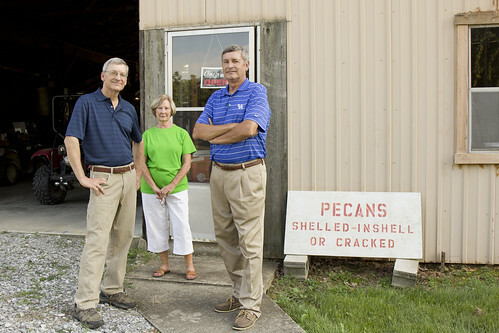 Roby approached his pecan venture with the same engineering mindset he used in nuclear energy. He thoroughly researched tree varieties before settling on what he thought would work best in Western Kentucky. "He started out with over 2400 trees," says Steve. 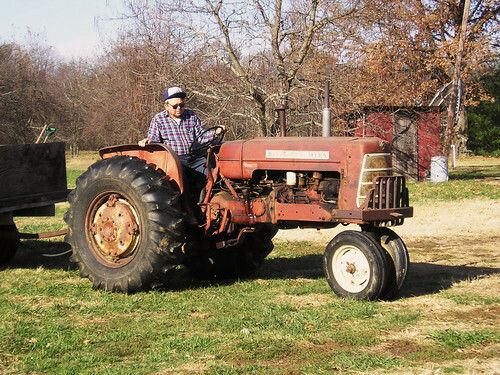 "He and Martha and Ric planted them with a posthole digger on the back of a tractor. But all the trees died!" "He had ordered trees with northern root stock," explains Ric, "but they had mixed the order and sent southern root stock. The first cold winter, it killed them. What you see here now we planted from seeds after that. We started trees from seeds in milk cartons, barrels, whatever, and when they got big enough, we grafted them in." Roby added wells to the farm along with an underground irrigation system in order ensure proper watering. He also invested in harvesting and sorting equipment. Around mid-October each year, the labor of the year comes to fruition. A shaker is attached to a tree with rubber pads. "Shaking can only occur once the nut has loosened itself from the husk," explains Steve. "It'll vibrate the ground for thirty feet away from the tree. And the nuts will start coming down, and it will throw some of them. So you better not be standing close!" Once the nuts are down, a harvester combs the ground, picking them up with rubber "fingers." The nuts are separated from debris and are taken to be sanitized and processed. Many make their way through a cracker and on to a vibrating, sorting table where any remaining shell is removed. The pecan kernels are then packaged, and any that will not be sold right away go into a zero degree freezer. "Freezing stops the clock on a pecan," says Ric. 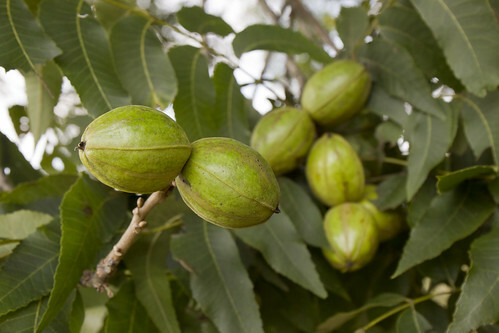 "The pecans are low moisture, so they are well suited for freezing. They don't age and they don't get freezer burn. Otherwise, the oil in them does go bad after a while, and they just won't last. This allows us to sell a quality product year round. We can put about 10,000 pounds of pecan kernels in the freezer. "And dad was truly a champion on the quality side of it. I've seen him get rid of several thousand pounds of pecans because he didn't feel like it was top quality. He'd sell it for squirrel food. It had to be the best. He had a joy in giving people quality pecans they couldn't get anywhere else." "And in the last several years, he was amazed at how big it got and how he had to expand to sell his product," adds Steve. "We connected with Kentucky Proud and now have customers across the state and beyond—from individuals coming to the orchard during harvest to restaurants to bakeries to beer brewers who want to ferment pecans for beer. We have a customer in Lexington who runs salad bars and will go through 200 pounds of kernels a month." Roby's vision in 1984, although large, couldn't compare to the growth that would occur by 2016. He was able to see and experience it before his death in January of this year. And still, the orchard is yet to reach its full potential. Ric and Steve carry on the work with an approach akin to their father's. They are steeped in the life of the pecan orchard. It has become instinctive. "I don't think dad, as enthusiastic as he was about pecans, conceived of the size these trees would get," says Steve. "He was used to ten pounds per tree, and after a while, he might be getting 10,000 pounds total and selling out. And he was happy with that. But a mature pecan tree can produce a thousand pounds an acre. Somebody, after our lifetime, may be getting 50,000 pounds off this orchard." The trees will continue to stretch and grow toward the warmth of the sun. For decades to come, their yield will increase as they draw life from the land Roby held dear—row after row of trees, bearing year after year of legacy.